In Tidewater Virginia, summer birdwatching can be particularly satisfying as the variety of species that visit is astounding. Marshes, creeks and lagoons are excellent places to explore in summer. These estuaries are frequented in summer for several species of ducks, geese, herons, egrets, kingfishers, and birds of prey. National, state and local parks often provide access to these environments. Other options for exploring Tidewater Virginia waterways includes boat tours, kayaking trips, and nature walks. Coastal Virginia’s beaches and shorelines hold a variety of birds in summer. These areas often include many species of gulls, terns, sandpipers, plovers, sanderlings, and other shorebirds. Woodlands and forests are excellent destinations for summertime birdwatching in Hampton Roads. 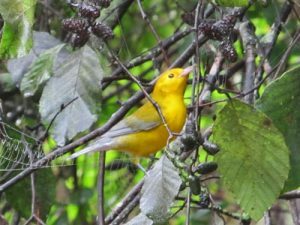 Several parks have woodland trails where visitors can see many of Virginia’s most beautiful songbirds, woodpeckers, and other forest dwellers. Freshwater lakes are occupied by many species of birds in summer. These include some of the nation’s most unusual and odd looking birds, such as grebes, coots, and cormorants. Ospreys and other birds of prey often nest around lakes and reservoirs. Many of these impoundments are brooding areas for waterfowl and shorebirds, offering birdwatchers and photographers a chance to see birds raise their young. Summer bird feeding stations receive a variety of visitors. Although wild food is plentiful, birds still visit bird feeders during the summer season. Feeders that offer specialized foods such as fruit, nectar, and thistle seeds often receive significant visits. Bird baths, fountains, and watering stations are also important and as water becomes scarce, local birds visit to drink more frequently.